Are you dreaming of a painted furniture piece with a little bit of sparkle and shine? 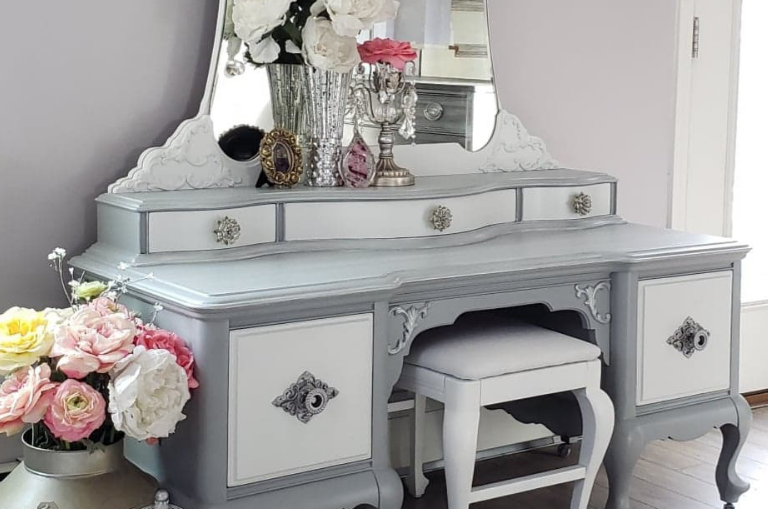 Chic and Shabby Furniture By Rebecca has created a beautiful masterpiece with Dixie Belle Paint to help you out! 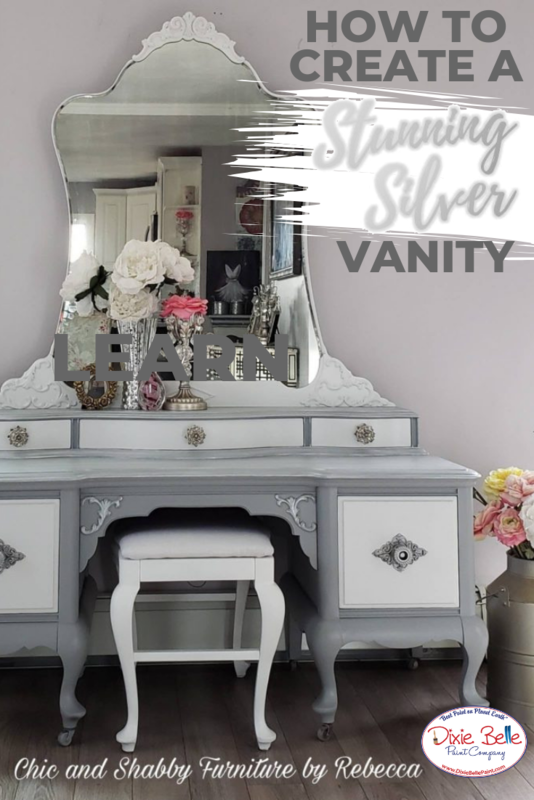 Get all the glittery details on this stunning silver vintage vanity from the early 1920’s. I will tell you I have a bit of an obsession with early 1900’s furniture, especially vanities! So, I started this project by cleaning with White Lightning! White Lighting is the perfect way to clean your project prior to painting so the paint will adhere to the surface. Next, I decided to sand the whole piece down as much as possible. I started with an 80 grit using an orbital sander then, down to 220 to smooth it. Don’t worry though! 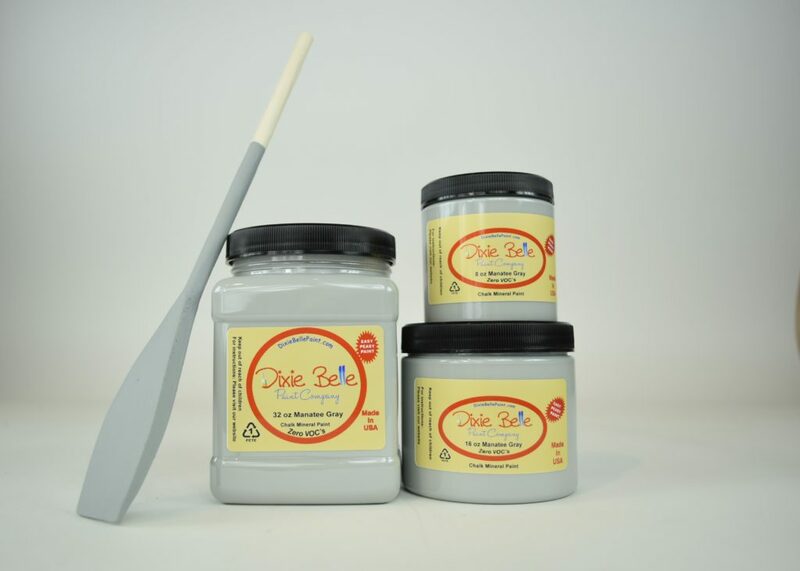 Sanding is not required with Dixie Belle Paint! I just decided to sand this specific piece because it had a lot of dents and dings. I used a few different colors and products on this piece, but don’t let that deter you from starting on your own piece. Color combinations can be so much fun and Dixie Belle Paint is easy peasy! I applied two coats of Dixie Belle Paint in Manatee Gray with Hurricane Gray and Fluff. I added a coat of Dixie Belle Paint’s Best Dang Wax in Clear. Once that was dry, I mixed Silver Metallic Basecoat and Pearlescent Glaze. I brushed it on the top and did not wipe it back off. As for the drawers and that gorgeous mirror, I added two coats of Fluff and Best Dang Wax in Clear. Once that was dry, I used Pearlescent Glaze on the drawers and mirror. Oh la la, I’m in love! This project was so much fun to complete and I cannot wait for the next one! 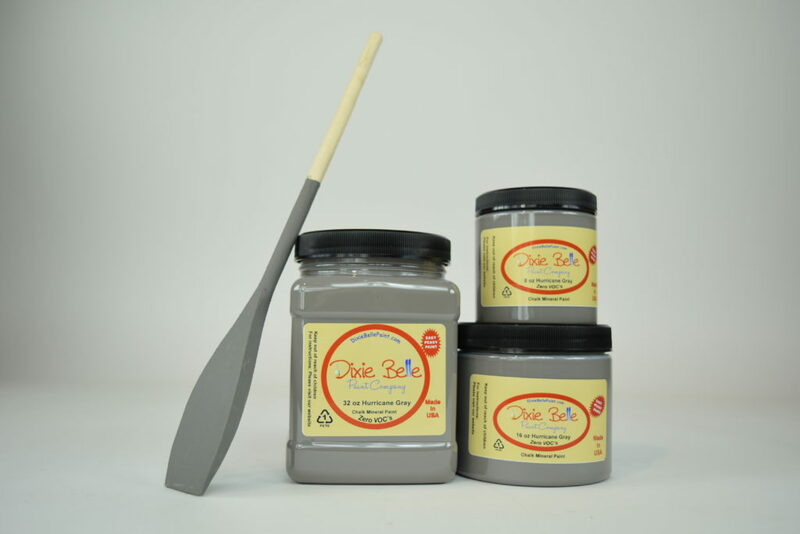 Are you looking for more details on the Dixie Belle Paint colors used? Keep on reading! This project was so much fun to complete and I cannot wait for the next one! Are you looking for more details on the Dixie Belle Paint colors used? Keep on reading! Just like the gentle giants, Manatee Gray is a tropical hue that is big in color and quietly calming. Manatee is a refreshing, aquatic gray that will most definitely bring ease to any piece of painted furniture! Fluff is a soft, marshmallow white with a bold aesthetic all its own. Fluff is an easy way to add a clean and crisp white to your home! Hurricane Gray looks like stormy, overcast skies! This is a moody dark color perfect for accenting any piece of furniture. 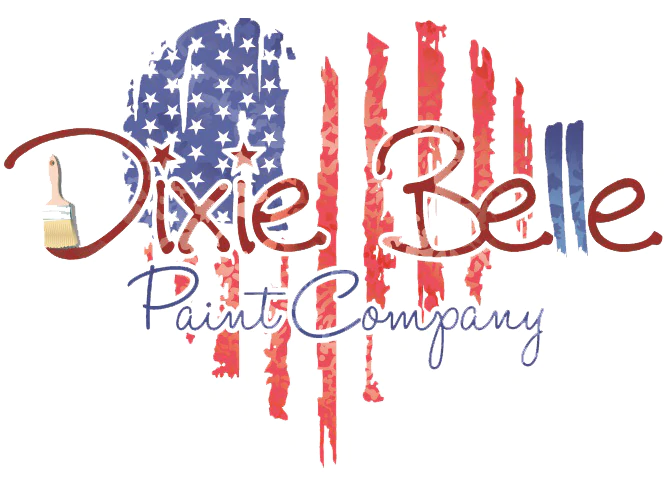 Have you used Dixie Belle Paint before? No waxing, priming, or sanding is required! 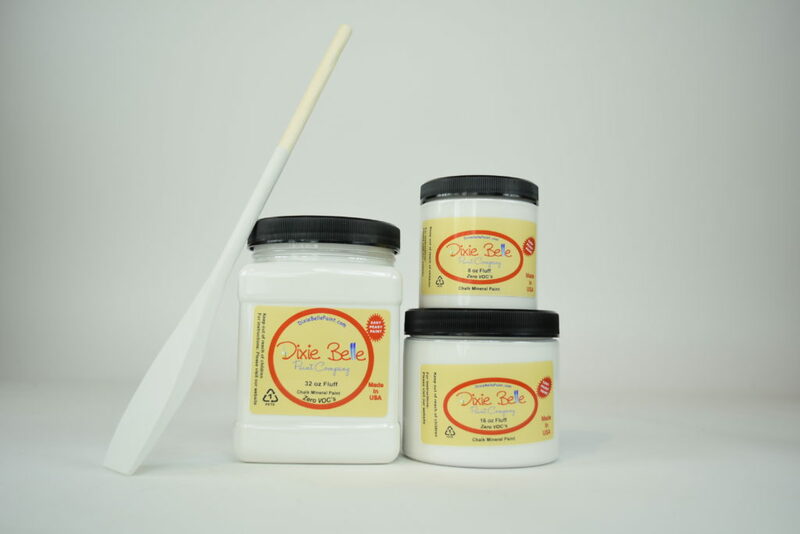 Dixie Belle Paint is high quality and easy to use. Most importantly, it’s priced so every DIYer can create and discover the joy of painting. Chic and Shabby Furniture By Rebecca is about all things vintage with a modern twist. She enjoys renewing and "bringing back to life" furniture and decor in custom colors and styles. She is passionate about up-cycling old furniture and specializes in creating custom color to suit individual styles. Our paint will make you say "Ikat believe how easy this is to use!" We love this funky design created by layering several colors. This fabulous dresser was painted with Bunker Hill Blue, Palmetto, Evergreen, Sand Bar, Hurricane Gray, and Midnight Sky.